^ "Skin care" (analysis), Health-Cares.net, 2007. [2012-09-04]. （原始内容存档于2007-12-12）. ^ Clarke, BT. The natural history of amphibian skin secretions, their normal functioning and potential medical applications.. Biological reviews of the Cambridge Philosophical Society. 1997, 72 (3): 365–379. PMID 9336100. doi:10.1017/s0006323197005045. ^ 6.0 6.1 McGrath, J.A. ; Eady, R.A.; Pope, F.M. Rook's Textbook of Dermatology 7th. Blackwell Publishing. 2004: 3.1–3.6. ISBN 978-0-632-06429-8. ^ Iozzo, RV. Basement membrane proteoglycans: From cellar to ceiling. Nature reviews. Molecular cell biology. 2005, 6 (8): 646–56. PMID 16064139. doi:10.1038/nrm1702. 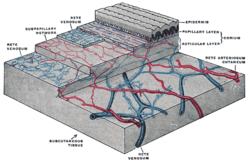 ^ Breitkreutz, D; Mirancea, N; Nischt, R. Basement membranes in skin: Unique matrix structures with diverse functions?. Histochemistry and cell biology. 2009, 132 (1): 1–10. PMID 19333614. doi:10.1007/s00418-009-0586-0. ^ Smith MM, Melrose J. Proteoglycans in normal and healing skin. Adv. Wound Care. 2015, 4 (3): 152–73. PMID 25785238. doi:10.1089/wound.2013.0464. ^ McCracken, Thomas. New Atlas of Human Anatomy. China: Metro Books. 2000: 1–240. ISBN 1-58663-097-0. ^ Sherman, Vincent R. The materials science of collagen. Journal of the Mechanical Behavior of Biomedical Materials. 2015, 52: 22–50. PMID 26144973. doi:10.1016/j.jmbbm.2015.05.023. ^ Bush, James A. Skin tension or skin compression? Small circular wounds are likely to shrink, not gape. Journal of Plastic, Reconstructive & Aesthetic Surgery. 2015, 52: 22–50. PMID 26144973. doi:10.1016/j.jmbbm.2015.05.023.